3 Idwala - Bela-Bela Accommodation. Please Note: Sending an online enquiry is preferred, please click the red button that says "Send Email" on top right hand side. This private property in the heart of Mabalingwe will afford you the luxury game reserve holiday you've been wishing for! The brick and thatch structure has four double bedrooms and five bathrooms. The loft sleeps another two people in single beds. Each of the beds has electrical blankets for the winter. Bedding and towels are supplied. The open living area has a fully fitted kitchen (stove, oven, microwave, fridge & dishwasher) and dining room with big ten-seater table and open wood fireplace. The adjacent lounge is fitted with a TV (with DStv) and a small Hi-Fi. There is cellphone/GPRS reception. You will have a magnificent view of the bush and the Gorcum dam. Game can be viewed from the deck, which connects the house to the undercover BBQ area with table-dining for 10. There is a small plunge pool. Please bring own swimming towels. 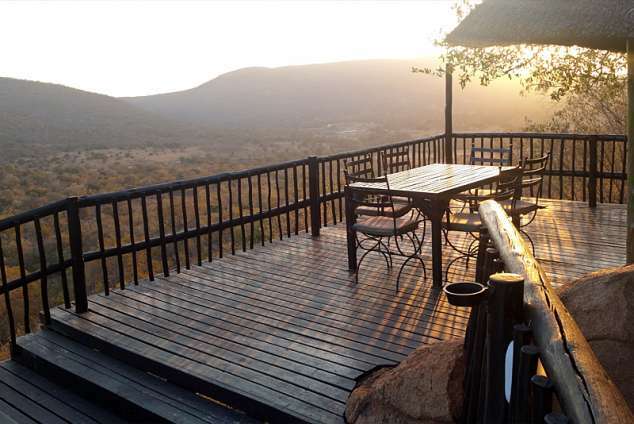 Mabalingwe boasts the "Big Five". The lions are safe in a separate camp, but you can book to attend a feeding (R60.00 per person). Game can also be viewed from your own vehicle, on horse safari's or while bird-watching. There is communal entertainment area at Mabalingwe that has swimming pools, tennis & squash courts, and other entertainment activities (archery, paintball, abseiling, putt putt, Jacuzzi, sauna and volleyball). Ingwe, the main camp, also has a restaurant and a ladies bar. There is a shop on the premises as well as an ATM. This house is ideal for a quiet stay in the bush. We can not accept noisy groups. 91497 page views since 14 Jun, 2006.